Blogging Joomla theme from studio JoomlaBamboo. Lacuna template made in bright colors, having a fine texture, smooth gradients, and many other features. 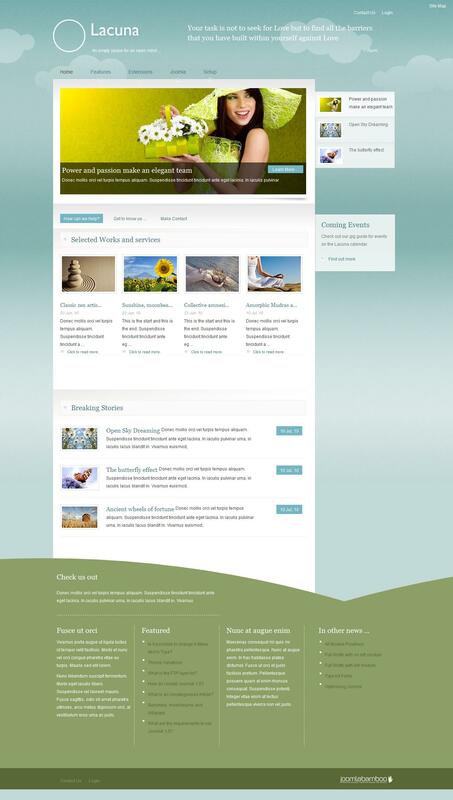 Template Joomla Lacuna has 11 color variations, 4 different background and design options 8 footer. The template is made on the framework, ZenGrid and has over 50 module positions. Lacuna template enables to combine three elements of design with a different color palette. You can choose the background color of the template, select the display typography based Hilite and combine it all with the color of the footer to create your own multi-colored pattern. In the default template has a number of simple background colors and gradients as textures, but this template has to switch textures and colors that changes the upper part of the background.